I live in Puglia, ok, but I can’t know all the places in this marvellous region well. Every day I never stop learning new things. 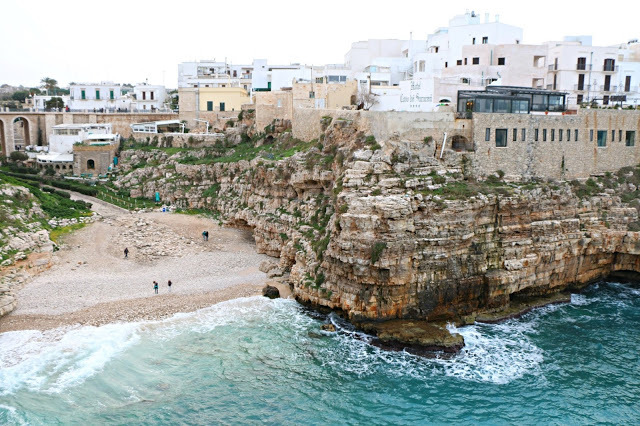 For example, I don’t know the area of Polignano a Mare well. 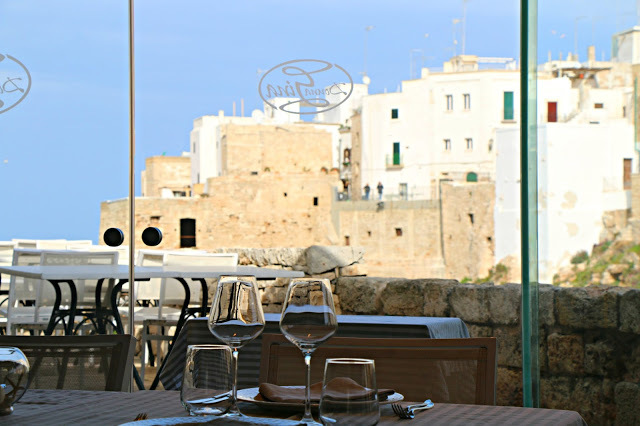 Some time ago I read a post about places to go and eat in Polignano written by Manuela Vitulli of Pensieri In Viaggio a local travel blogger that knows more about it than me and so I asked her: can I post your suggestions on my blog? Here are the results: a list of restaurants, inns, taverns, street food places and ice cream parlours where to go and taste the products of the area while you are on holiday in this spledid corner of Puglia. Thank you Manuela! Let’s begin (all pictures of this post by Manuela). Polignano now smells of home. I stroll along its alleys and I feel at home. Yet. Well, I never get used to its beauty. I continuously take photos incessantly like a tourist that visits the city for the first time. And so I let myself be overcome by its inebriating atmosphere, by its magic, by its food. Yes, in Polignano food is really good, it’s good almost all over the place. 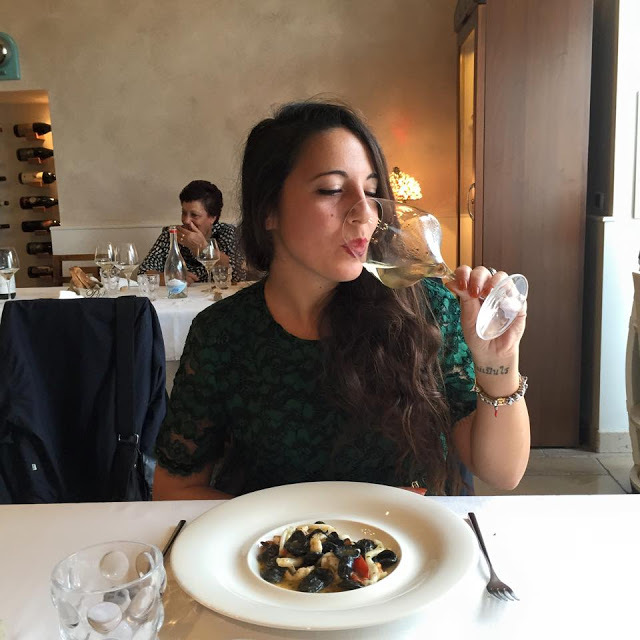 The quality of the cuisine, unlike other places, is in my opinion much better and there are so many excellent restaurants (inns, taverns, pizzerie…) that a whole month wouldn’t be enough to try them all out. Because so many of you write to me and because I have stopped in this beloved place many times over the years for lunch and dinner I will tell you what my favourite places are to eat in Polignano. I would like to specify that in this place I am writing about the places I have tried personally therefore my observations are only and exclusively the result of my experience and my taste (certainly debatable). I can only add that all those who have entrusted themselves to me to eat in Polignano have always been enthusiastic at the end of their gastronomic experience. Try if you don’t believe me! Donna Gina. A refined fish restaurant in the heart of the city. I advise it for those who want a good cuisine but also for a picturesque surrounding like the Lama Monachile one, the most loved and photographed view in Polignano. When I had lunch here I couldn’t get my eyes off the view, believe me. The Osteria di Chichibio. It’s very close to the statue of Domenico Modugno and its one of my absolutely favourite places, I confess. A particular atmosphere, sophisticated but at the same time relaxed, mixed with elements that taste of sea. On one wall there are dedications left by famous personalities that have dined here, on another the collection of wine labels for all to see. Unfortunately it isn’t possible to eat outside in the open but to make up for it the staff is always very kind and the hors d’oeuvres are divine. There aren’t many places to sit at therefore I warmly recommend you book in advance. The Trattoria della Nonna. Following the advise of a lot of friends, I tried this place in the last few days. Even if I had booked I had to wait almost an hour to be seated but I think it depended on the incredible flux of the holiday period. It proposes a good fish menu. The furniture is rustic but at the same time very cured with white curtains and tassels. The first courses are very good. The Pescaria. The sandwich in Polignano is only one: the Pescaria sandwich. Since it opened (just over a year ago) it has made a name for itself so well that it’s become one of the symbols of the city. Many very good fish dishes are proposed. Not only sandwiches but also salads with tartare, fried fish, fishballs and even vegetarian and vegan dishes. The new place, larger than the previous one has reduced waiting time a lot. The average price of a sandwich is between 8 and 12 euros but it fills you up so much that it can be considered a full course meal. The Al Buco Preferito Tranquillage. In the very centre, this pizzeria lies just after the Lama Monachile bridge (or just before it according to the direction you are coming from). A nice little place where you can eat an excellent pizza even more so if you sit outside in a warm summer evening. The hors d’oeuvres in terrines are very good as well. The Focacceria Delle Noci. One of the best focacce I have ever eaten, I swear. The classic Barese focaccia is very good but my favourite is the courgette one. It is usually open till 14:00-14:30 and opens again at about 17:00. 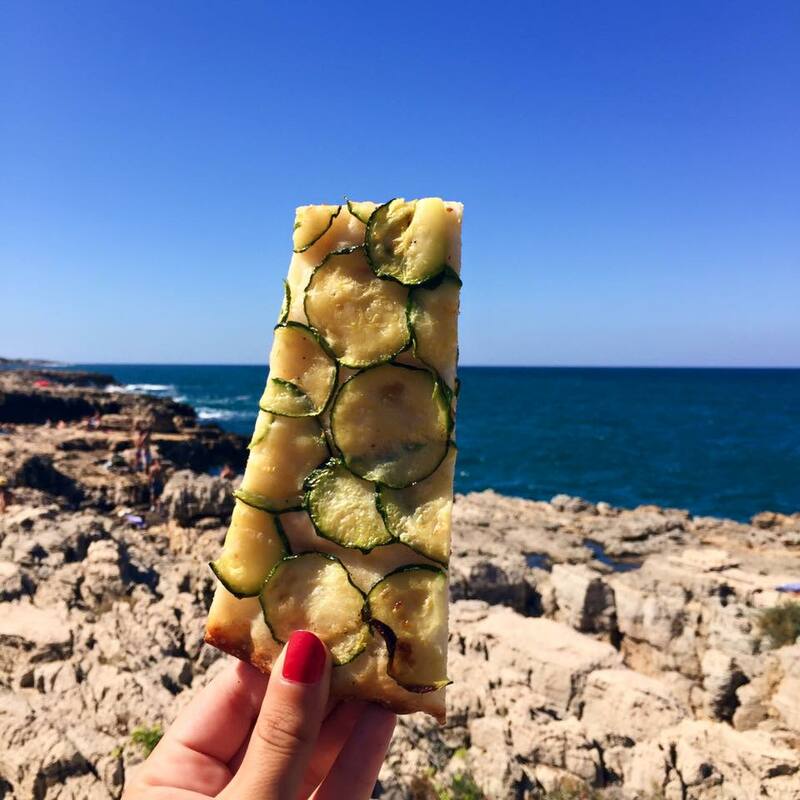 I confess that this focaccia is my favourite snack to eat at the seaside. The Caruso. The best ice cream in Polignano according to many people. The Casa del Mojito. I have a soft spot for this small place hidden (not so much) in a little alley of the historic centre. It proposes mojitos of every kind (my favourite is the ginger mojito) to be sipped outside sitting on the steps of adjacent houses or on one of the stools the place puts at your disposal. An easy and fresh atmosphere, very young style. The Fly. I advise it for the colours that look tremendously like summer and holidays and for the view on Lama Monachile. Ideal to sip a cocktail but also to nibble on something. The Super Mago del Gelo. The history of Polignano is in this bar and corner in the very heart of the centre that has remained practically identical in decades. Its speciality is special coffee, invented by Mario Campanella and prepared with added cream, amaretto and lemon peel. I like it very much. I thank Manuela Vitulli for her availability to share her suggestions with us. 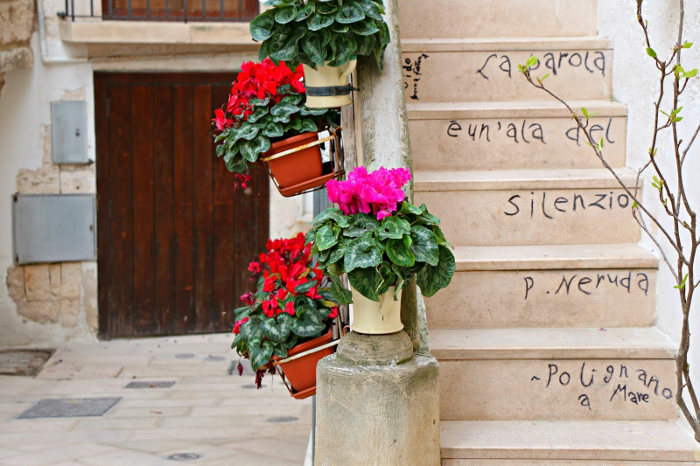 thank you … wonderful tips ,seeing that I will be visiting Puglia in September and an avid food tourist!